We often hear that global warming will eventually be the end to all of us. The message is pervasive, and it has been trumpeted again by a newly-released report from the Intergovernmental Panel on Climate Change, the IPCC. While renewable energy advocates, anti-pipeline activists, and others attempt to use global warming as a “trump card,” when lobbying for government policies and mandates for their preferred sources of energy, its important to look at whether these claims are supported by the scientific evidence, especially as President Trump has removed the United States from the Paris Climate Accord (not a treaty), and rescinded the Clean Power Plan. For those of you who don’t know, Judith Curry is an atmospheric scientist who often writes about the climate issue at judithcurry.com. she has written a brief analysis of the new IPPC report. The main takeaway is that the models used by the climate scientists are running too hot, predicting more global warming than has actually occurred. Carbon dioxide in the atmosphere will produce some global warming, but how much warming is a matter of massive uncertainty. This uncertainty is what makes attempting to craft public policy, like Minnesota’s Social Cost of Carbon utility planning, so dubious. We don’t know what the warming will be, and we don’t know what economic conditions in 2100 will be, but we can put an accurate price on each metric ton of CO2 entering the atmosphere? Give me a break. Imagine what people in 1918 thought the economy would look like in 2018 and see how accurate their estimates were. The good news is that it is better written and with better diagrams — no more turgid prose and obscure diagrams that we’ve come to expect from the IPCC. The bad news is of course best articulated by Al Gore [link], including a dig at President Trump. I don’t see much in the way of new science or better ways of assessing uncertainty — same old, same old. Projections are based on the CMIP5 simulations. There are some more recent references cited in the ‘impacts’ chapter. Most of this addresses the difference between 1.5 and 2.0 C impacts, and also strategies for mitigation etc. The main issue is removing CO2 from the atmosphere, in the absence of being able to meet emissions targets. 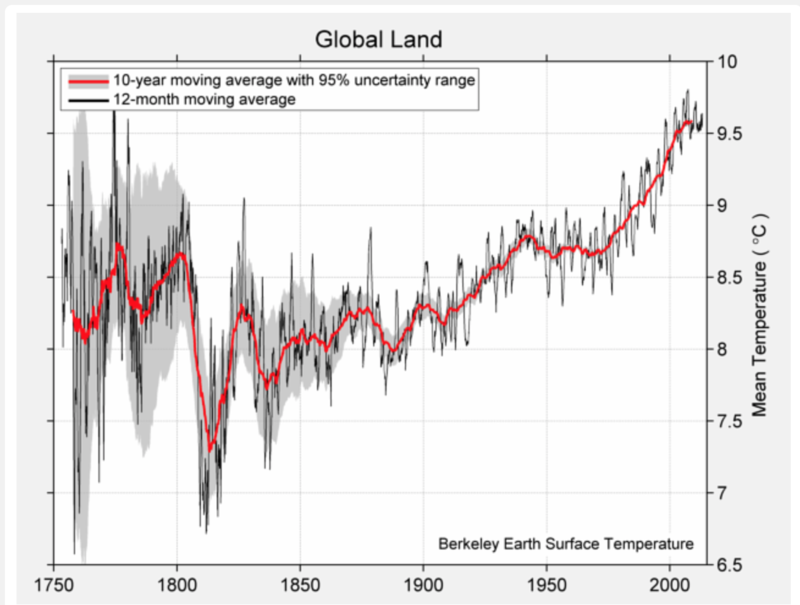 Over land, we have already blown through the 1.5C threshold if measured since 1890. Temperatures around 1820 were more than 2C cooler. There has been a great deal natural variability in temperatures prior to 1975 when human caused global warming kicked in any meaningful way. And the IPCC climate model projections ignore the bottom third of the ‘likely’ climate sensitivity values – 1.5 to 4.5 C -, with only the outlier Russian model having a value of ECS as low as 2.1 C. Much of this problem goes away if ECS is actually 1.5 to 2 C.
And then there is the goldilocks issue. Who would prefer the climate of the 18th or 19th century relative to the climate of the early 21st century? Apart from warmer temperatures, what evidence is there of potential catastrophes? An observed increase in extreme weather events is not well justified, if you correctly account for the influence of multi-decadal ocean oscillations. So, what is the possible worst cast impact for 1.5 or 2.0 C warming on the timescale of the 21st century? collapse of the West Antarctic Ice Sheet, possibly resulting in up to 2.5 m sea level rise as per the NOAA (2017) report (actually, the IPCC does not even make this case, they are predicting SLR of 1-2 feet). This extreme scenario, which would maybe justify all this, is regarded as extremely unlikely, and we are not presently on such a trajectory. In any event, if the WAIS collapses it is more likely to be due to the geothermal heat flux and volcanoes beneath the ice sheet. Recent research shows portions of the WAIS rising at a rate of 41 mm/yr, acting to protect the WAIS from collapse. MASSIVELY uncertain. species extinction. After alarming conclusions in AR4, the AR5 backtracked, and this new Report backtracks even further. What about the ocean – acidification and declining oxygen? Our understanding is in its infancy, but this needs to be looked at more.